Hana - Destroyed versions of the smithy and Farmhouse04 meshes. 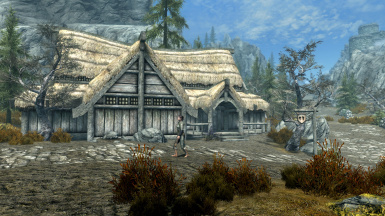 If the mod was installed after the dragon at the mound should be dead the NPCs were not being killed off and would be found wandering around a ruined village. Added a start marker in the inn for AS-LAL support. Fixed an intermittent problem with the innkeeper and server not always offering their service menus. Nebirta Sibotis was incorrectly set to use a male voice. The blacksmith's feet were clipping through the ground when using the armor workbench. His ore and ingot stacks on the ground were also not flagged as owned. Kiarde (and others) could get themselves stuck on a navmesh island on the hill somehow. That island has now been given jump links so the NPCs can get down. Her voice type also did not work with generic dialogue for some reason. So she's been given the FemaleCommoner voice now. Some of the NAVCUT boxes were not set to the right collision type which was causing NPCs to try and walk through fences. The crop farmers should now offer to buy any crops you've picked for them. 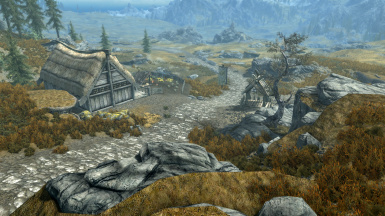 * A fully working town prior to Alduin's return. 3 farms, an inn, and a blacksmith. Plus town guard patrols from Falkreath Hold. 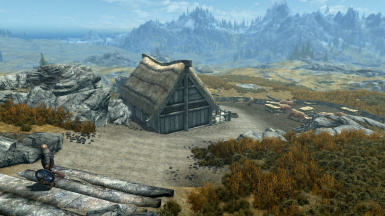 * Upon Vuljotnaak's resurrection by Alduin, the village will be in flames. This will last as long as the dragon is alive. * Following the dragon's death, the fires will go out but the town now lies in ruins, swallowed by the World Eater. 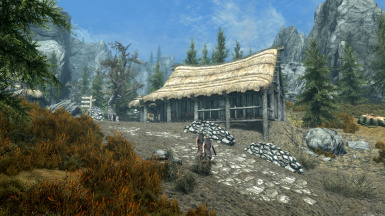 Skyrim Special Edition 1.5.62 or greater. Drop the .esp, .bsa and - Textures.bsa files into your Data folder. To remove the mod: Delete the Fall of Granite Hill.esp, Fall of Granite Hill.bsa and Fall of Granite Hill - Textures.bsa from your Data folder. Then reload your game as usual. 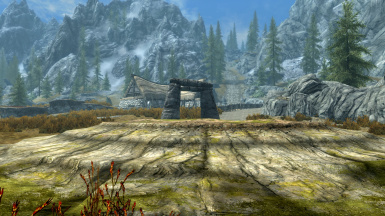 Will not be compatible with any other mods editing the area around the Granite Hill dragon mound. Events in the town rely on the status of the dragon mound at its center. These mounds are not always well behaved and it's possible that the town may never trigger the actively burning phase. Also keep in mind that if you install this at a point beyond which Vuljotnaak is already dead, all you'll see are the ruins. It may be possible to encounter leftover predators in the area that spawned before they were replaced with tame animals. Nothing can be done except to kill them.